Alongside the more traditional ways of securing your home such as Nightlatches and Mortice Locks; ERA also have a range of smart home alarms and intercom systems that add a further layer of protection to your home to deter a would be burglar. The ERA range of Alarm systems are easy to install wireless home systems suitable for most homes. 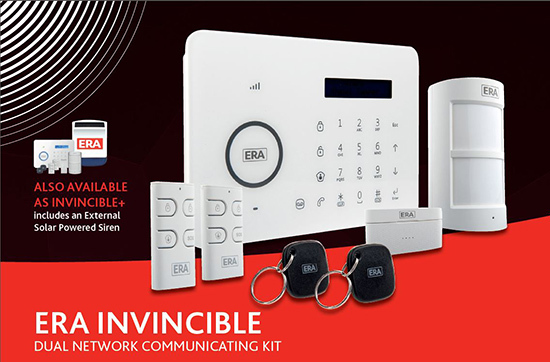 The alarm system communicates wirelessly so no need for messy installation wires and we have different starter kits and accessories available to suit your individual requirements. ERA's range of accessories include the WiFi HD Camera, Ceiling mounted or narrow beam PIR’s, vibration or water sensors, replica or mains powered sirens, plus handy contactless RFID tags and remote controls for arming and disarming. Alarm zones can also be set or part set for greater flexibility and for night time security; and many have a compatible App so you can remotely control and monitor your home on the move. The ERA Invincible is the most Elite Smart Home Alarm System within the range, offering a high specification alarm that is easy to install. Kit contents: LCD Control Panel, Pet Friendly PIR Sensor, Magnetic Door/Window Sensor, Two Remote Controls and Two RFID Tags. 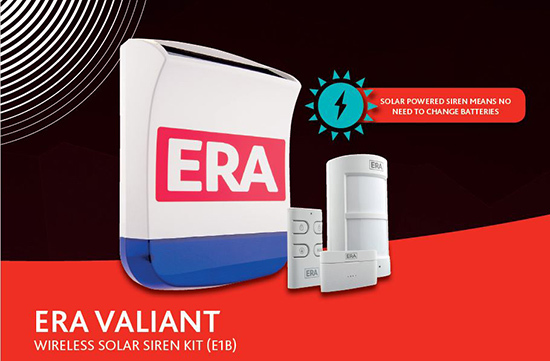 The ERA Valiant is a complete stand-alone Alarm System that is perfect for small homes or can be used as an expansion pack for any ERA Wireless Control Panel Alarm System. Kit contents: Solar Charged Siren, Pet Friendly PIR Sensor, Magnetic Door/Window Sensor, and Remote Control.